The migrating route of Inshore bluefin tuna and fishing place! Tuna caught in the coastal regions of the Japan Sea is notable as the best bluefin tuna in January. Iki, a small island in Kyushu area is one of the famous ports for tuna. In February and March, the tuna auction market becomes slack due to rough weather. Just a few tunas from Nachikatsuura where is also the famous port for tuna are on the market. In March and April, tunas become thin because their eggs need many nutrients. In May, large tuna is seldom seen in the Tsukiji Fish Market. Even if there is, its body is really thin. 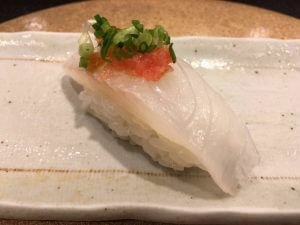 “Kinkaimono” which means a shore-fish is generally considered as high-class tuna, but in this season, imported tuna is useful instead. It is said that Pacific Bluefin tunas spawn around Japanese waters between Taiwan and Okinawa in April and May. And then, they go up to fertile, north sea along the eastern coast of Japan. 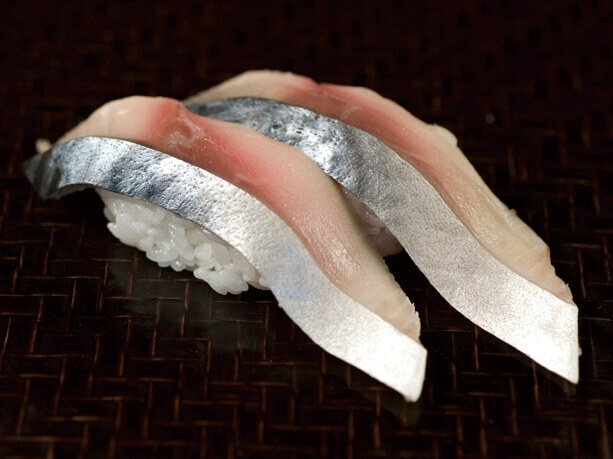 In June, “Chubo” which is young and small tuna is taken hugely off the coast of the Sea of Japan. The school of Chubo begin moving northward in this season. In July and August, tunas can be seen occasionally but their bodies are still thin. Instead, Boston Tuna which is caught in the Atlantic Ocean and nicknamed “Jumbo” is on the market. 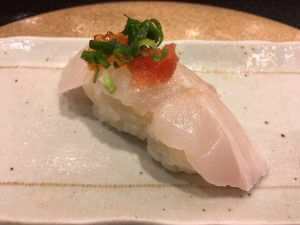 Its fresh is softer than “Kinkaimono” and it doesn’t have medium-fatty part which “Kinkaimono” has. In September, Boston Tunas are at their best with plenty of fat on them. The best season of Boston Tuna is limited and ends in October. 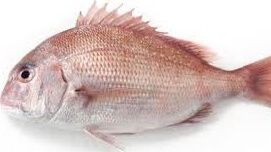 But fortunately, Japanese tunas come into season. 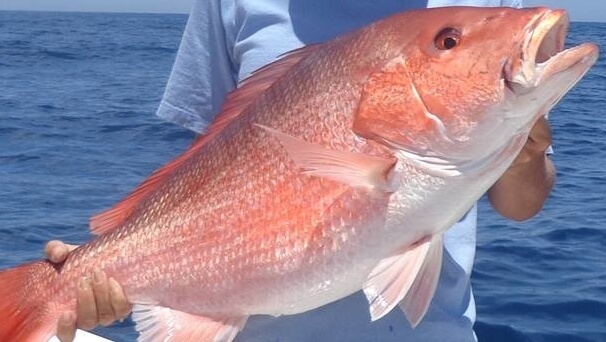 The school of tunas split up into two groups, the one takes Pacific Ocean route and another takes the Japan Sea route and both of them move northward along the Japanese Islands. Some of them reach the Tsugaru Strait where and the season of Tuna begins from September to next January. Oma town and Toi town is famous nationwide for its catch of tuna from the Tsugaru Strait. The flavor of tuna in September is still weak but it becomes stronger in October. In November, feed of tunas such as Pacific saury or Japanese common squid with plenty of fat increase and flavor of tuna also gets stronger. In December, the peak season comes around. A catch of tuna falls off in January and it enters the final season. The temperature of sea water gets cold and feed of tuna, squids decrease and the fishing season in this area ends. 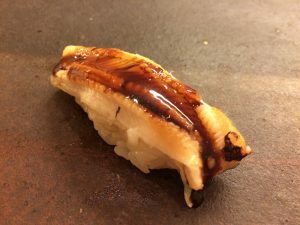 Posted on August 20, 2018 November 13, 2018 Categories Basic KnowledgeTags Edomaesushi, Fatty tuna, Inosinic acid, Maguro, Medium Fatty Tuna, Sushi Ingredients, sushi toppings, UmamiLeave a comment on The migrating route of Inshore bluefin tuna and fishing place! Why can’t Pacific saury be caught? On the Pacific Ocean side of Japan there is a three-way deadlock between sardines, mackerel and Pacific saury. There is a theory that the species take turns with increasing and decreasing populations. In recent years there has been an increase in sardines and, in turn, there has been a decline in Pacific saury. 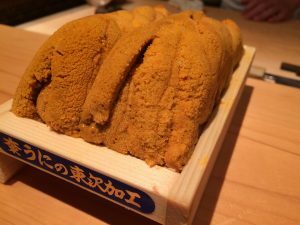 Posted on July 30, 2018 November 13, 2018 Categories EdomaesushiTags Edomaesushi, Nigiri sushi, Sushi Ingredients, sushi toppingsLeave a comment on Why can’t Pacific saury be caught? What is the difference between maturing and rotting? 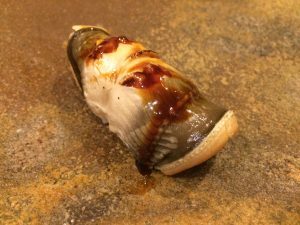 Posted on July 23, 2018 Categories EdomaesushiTags Edomae Shigoto, Edomaesushi, Nigiri sushi, Sushi Ingredients, sushi toppings, UmamiLeave a comment on What is the difference between maturing and rotting? We’ll introduce all sushi toppings throughout Japan, from Okinawa to Hokkaido! Engawa－Thin muscle of the dorsal fin of Japanese flounder, Marbled sole, etc. Tekka maki－Norimaki sushi roll with red tuna and grated wasabi at the core. 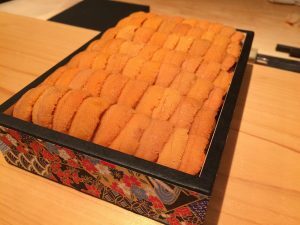 Posted on July 16, 2018 November 13, 2018 Categories EdomaesushiTags Sushi Ingredients, sushi toppings2 Comments on We’ll introduce all sushi toppings throughout Japan, from Okinawa to Hokkaido!